Stove top vanilla custard is one of those forgotten classics – serve it warm or cold with berries, so simple, so perfect. This is also a great base for a coconut cream pie – just fold in sweetened coconut into the warm custard (about 1/3 cup) and pour in a graham cracker crust. I like it by the spoonful out of the refrigerator.. 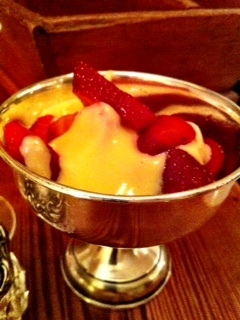 This entry was posted in Recipes and tagged Coconut, Custard, dessert, Strawberries, Vanilla. Bookmark the permalink.